This authentic self discovery e-book is written to inspire, uplift and inform. Through the power of inspiration, poetry and rhyme it will take you on a journey of self discovery - of stepping out of the mind. An authentic inner voice is what you'll find. Listen to your inner voice and let the life change begin. Raise your spirit - step out of the mind. The warrior within isn’t an idea - it’s a living, breathing truth inside. Inspiring words, thoughts and ideas - inspirational quotes, poetry and rhyme - can help you step out of the mind. Your authentic inner voice is what you find. The warrior within isn’t looking for war. It’s an instrument of peace down to its very core. The mind is where the war takes place. It houses the warring factions - their only home base. One thought pulling here, another thought pulling there - we get pulled in different directions - ending up everywhere. Strife, conflict and confusion are commonplace in the mind - is it any wonder the truth is sometimes hard to find? Inspiration helps us realize the warrior within and the positive life change it naturally brings. Where the mind is confused; the warrior is clear. Where the mind is far; the warrior is near. Where the mind has lost; the warrior has won. Where the mind is conflicted; the warrior is one. “Where is this inner warrior? What should I expect to find?” The warrior within is there - a mere step or two out of the mind. The mind has logic and reasons; yet the process of authentic self discovery is more like the seasons. The seasons are there, whether we think them or not. The changes they bring can hardly be taught. Reason is powerful and has its time and place; yet rhyme - like the seasons - can open up new space. Transformation is to encounter a mind shaped anew - it’s a path of self discovery we are on me and you. What's Inside The Self-Discovery Ebook? More than 1,000 inspiring life quotes, carefully chosen and thoughtfully categorized to help quickly find the inspiration you're looking for (see quotes categories in table of contents below). Thought provoking introduction to each section that helps set the stage for the inspiration that follows. 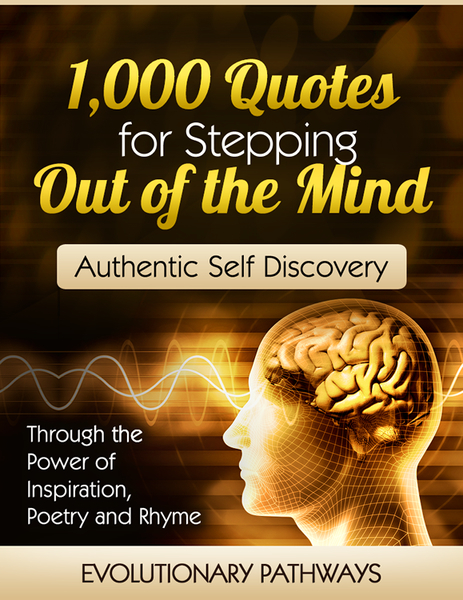 Forty seven insightful and inspiring poems for self discovery and life change through stepping out of the mind. Clickable table of contents for easy reference. 201 pages in clean PDF format (excellent for printing). Resist and React - What an Act! Now available on Kindle Amazon! 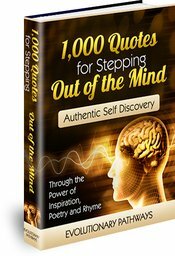 I am confident you will be delighted with your purchase of 1,000 Quotes for Stepping Out-of-the-Mind: A Handbook for Authentic Self Discovery. Nevertheless, if for any reason you are not satisfied with your purchase, please contact me within 30 days and I will refund your money in full, no questions asked. If you are unsure regarding any aspect of the purchase and download process you will find guidance at our easy download page. For any trouble shooting visit our frequently asked questions page. I wish you a pleasant and hassle-free experience with your purchase at Evolutionary Pathways. And thanks for your support!